In September of 2014, Sheila received a call from Central America. On the other end of the line was her husband Nate. Several years before this, the Lord had called Nate to gospel preaching ministry--both open-air and in churches, as the Lord would lead. God had opened the door for Nate to preach in many places around the world. This time, his preaching trip would be different. “I think the Lord wants us here…” came the cautiously spoken words over the phone, late one night. All Sheila could say was, “I knew you were going to say that.” Because our merciful Lord had told her already. 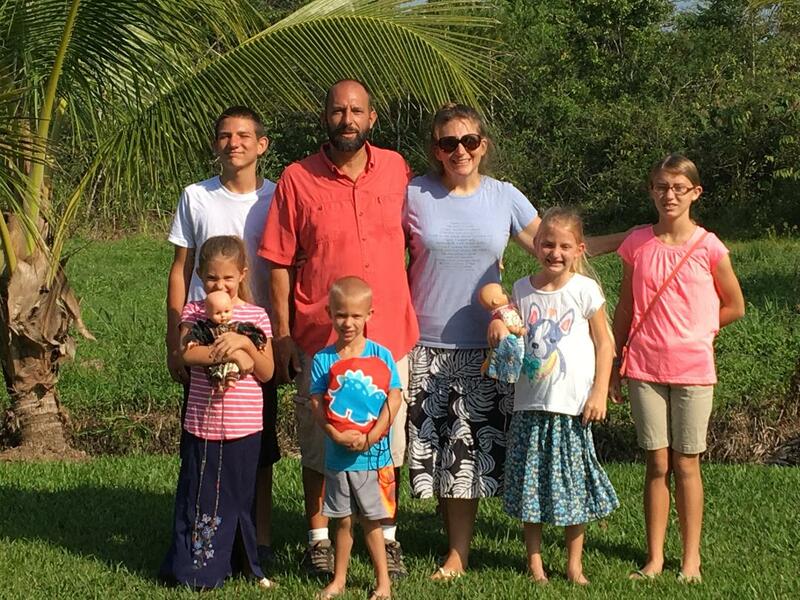 In February 2015, Sheila and Nate made a trip to Belize with their pastor and his wife to pray and seek God’s will for them. Did He really want them to move there? Well, they left Belize a week or so later; convinced that…yes, He did. But, He had a lot of details to sort out for them. Which He did, in short order. Their house sold in less than 3 hours, to the first person interested--with no realtor. 90% of their belongings were sold or given away within a few weeks of their departure. Every step of the way, God has opened doors and provided for them and their 6 children. Many people thought they were insane. “You’re packing up your six kids and everything you have, and moving to a third world country?? ?” That makes no sense. But, our thoughts are not His thoughts. And nothing is impossible with Him. They are just “regular” people who were living a “regular” life; pursuing obedience to a holy God. Over 350,000 gospel tracts, 50,000 gospel pamphlets and over 11,000 bibles have been distributed by the Steuers since they arrived in May 2015. Just recently, 5,000 Garifuna bibles were distributed throughout Belize, Honduras and Guatemala. The Lord has also opened the door to have 1,000 De Bibel (low German) bibles reprinted for distribution into Mennonite communities. Glory to God! Over the last year, the Lord opens new doors for them to minister to the Belizeans. Just recently, He opened the door for over $35,000 in study Bibles and gospel books and materials to be donated to them. These materials will be placed into the hands of local indigenous pastors hungry to learn more about our Lord and Savior Jesus Christ. This will allow them to be better equipped to share with the flocks they oversee. Praise God! There is much work to be done in Belize. The Steuers praise God He has chosen them for this battlefield, for His glory! Come join them on the journey the Lord has placed them on, by following their BLOG and NEWSLETTER, and prayerfully supporting His ministry here in Belize C.A..